Flyball is a hurdle relay race for a team of 4 pure- or mixed-breed dogs. Each dog in turn goes over four jumps spaced 10 feet apart. 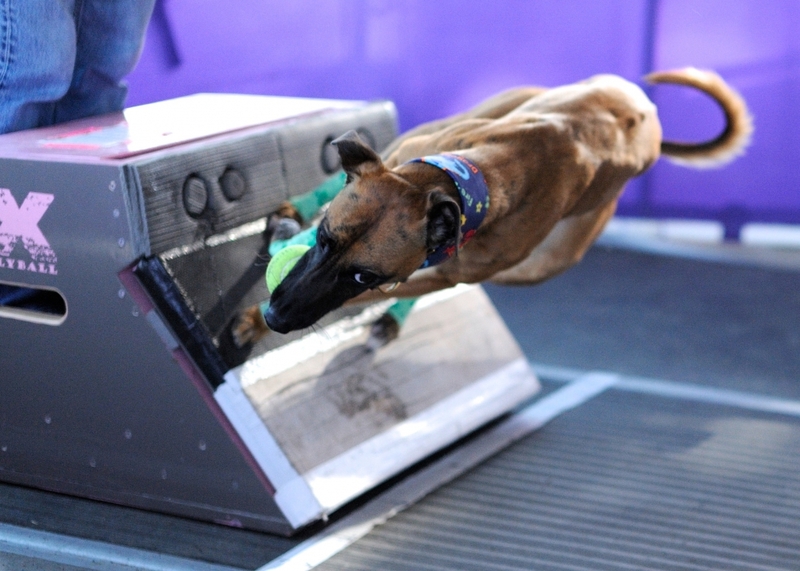 At the end of the four jumps is what is called a flyball box. The dogs press the front of the box with their paws and it shoots out a tennis ball, they catch it and go back over the four jumps. Once one dog passes the start/finish line the next dog starts. Flyball is very exciting to watch, and with its focus on team competition, it is a highly social activity for the owners, and the rate of growth in this sport has been remarkable. In North America, Flyball is governed by the North American Flyball Association. NAFA awards titles to dogs based on their lifetime point accumulation. Points are earned by running on a team that completes the four-dog relay in sufficient time. Whippets can be very good at flyball due to their speed and agility, but some do not enjoy playing with balls, so look for a happy retriever that is very high energy and playful if you are interested in Flyball with your Whippet. Flyball competitions are extremely noisy, indoor competitions, so Whippets that react fearfully to loud noises and crowds are also not good candidates for this sport.